Just over a month ago unbeaten Welterweight prospect Freddie Turner (pictured) was wondering when, and even if, he would get to fight again, having had just the single outing in 2012 and it seemed there were absolutely zero fights on the horizon. However things soon changed for the 24 year old from Canning Town, following a call from his coach, Mark Tibbs, suggesting he has a word with TRAD TKO’s Johnny Eames next time he’s in the gym. Sure enough Freddie did and within the hour signed management papers with the esteemed Mr. Eames, after former manager Dean Powell agreed to release him early from his contract. The same day Johnny asked Freddie if he wanted a fight in February, which of course he did. On Sunday afternoon, at York Hall in Bethnal Green, Freddie had his maiden outingunder Johnny’s watchful eyes, against Rainham’s Costas Osben, and repaid Johnny in the best possible way, with a sensational performance on way to securing his seventh win. Earlier today Freddie took a little time out to talk about the turnaround of fortunes this change of management had made. “I’m really excited to get my career going again, I’m really happy that Johnny has a plan and the whole team has a plan and we’ve got a future in the game. I had just the one fight last year, nothing to do with myself, I’m always in the gym and ready, I’m always training and I’m fit, but I just got left out really. My old manager, Dean Powell, I know he’s a busy guy and has a lot of fighters but I didn’t get looked after or get the opportunities I deserved, it’s not that I’m not a prospect or a good fighter. I think I am one of the best prospects in the UK, I’ve got great potential and talent so hopefully we’ll see it come through now. Within hours of agreeing terms with Johnny and the team, they got me a fight, gave me a date. The next week they offered me another fight, then one in April and then I hear rumours that there are other dates already being lined up. This is amazing, It’s unknown to me in the game, considering what I have had before. Johnny said I’ll have a minimum of four in the UK and there may be a few abroad, anything else they do for me will be a bonus, that’s already four hundred percent on what I did last year, so it’s amazing. I’m mature now, the people I spar and the quality I spar I’m an eight round fighter, I know what I’m doing now, this first fight was about getting the wheels turning again, but I’m nearly at Championship level, it wont be long before I’m there, I feel I’ve got the tools, the ambition and the art to make it and do something. If some kind of opportunity comes I’ll jump at it, I’m always fit and I’ve got a good engine anyway, I can do four without training, I’ve got a great engine so a twelve rounder with a little work and I’ll be there. Training wise I’m still with Jimmy and Mark Tibbs, who are here at the TRAD TKO anyway, it’s a lot better now because everything’s under one roof, you’ve not got to go anywhere else, management team, promotion team and trainers is all there and it’s dealt with right away. The training’s going really well, enjoying it. 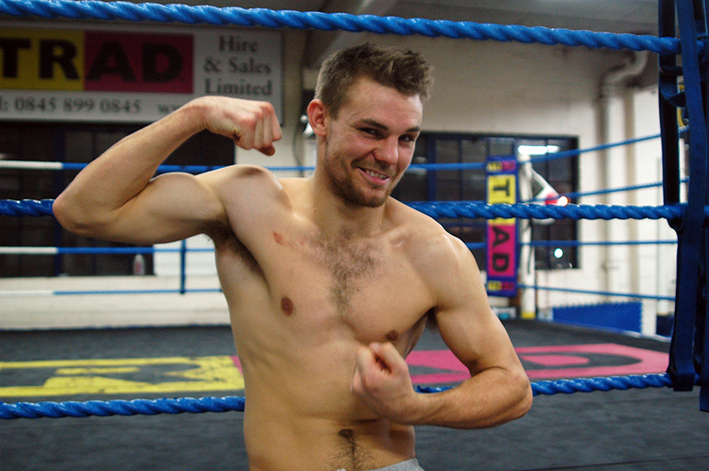 Jimmy’s doing really well with Billy Joe (Saunders), he’s flying through there. Mark’s got a load of young prospects coming through too.